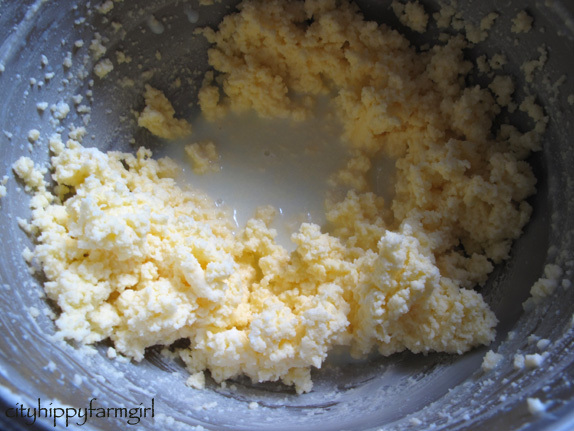 I think every blogger who ever dabbles in food posts, has done a how- to- make- yogurt and/ or butter at one time or another. Just to add to the lovely collection- here’s my way. 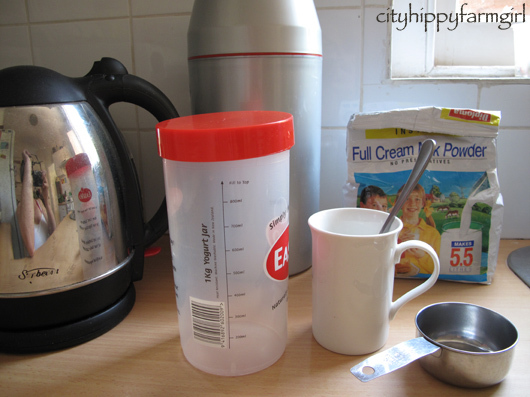 kettle, yogurt thermos, yogurt container, powdered milk, 2 heaped tablespoons old yogurt, water, measuring cup. Time it takes- do it in the time it takes to boil the kettle. Fill your kettle up and turn it on. Take 2 heaped spoonfuls of bought yogurt (like the end of the tub), add a little water to mix it, it’s now runny and set aside. 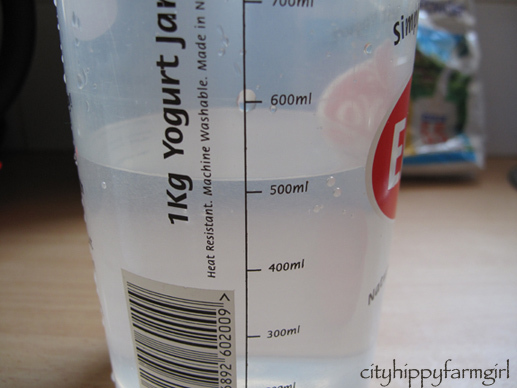 Fill your yogurt container half full with water. Add one and a half cups of powdered milk. No need to shake it down and fit as much as you can, just roughly 1 1/2 cups. 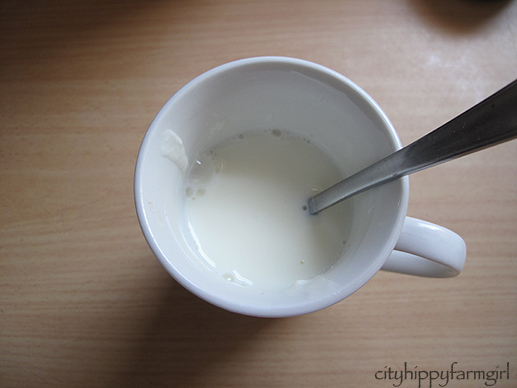 Mix it with a spoon and add your runny yogurt mixture. Mix again and fill the rest of the container up with water. Lid on, give it a good shake. $20 for the yogurt maker, and each litre of yogurt I make, works out to be about $1.50 a batch. I then add any of our homemade seasonal jams to sweeten the yogurt. Dead easy. You are saving a whole bundle of money, no more plastic tubs and you don’t have the usual paragraph of ingredients that’s in a lot of yogurt today. Keep it whipping until it starts to look like this. The liquid will start to separate, which is then able to be drained off. 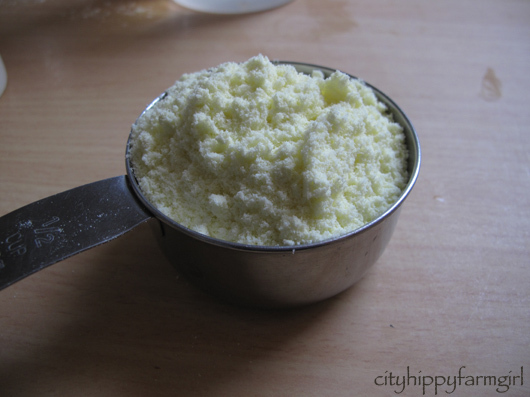 Add a pinch of salt (to taste) and keep squeezing out that excess moisture using a spatula against the side of the bowl. You don’t want any of that moisture in there. Once it is all drained off it can be shaped into what ever shape you need. Next time you see one of those fancy pancy butters imported from countries far far away, you can have a little chuckle at the thought of spending that much money on butter and then go home and make it yourself. Again, dead easy. 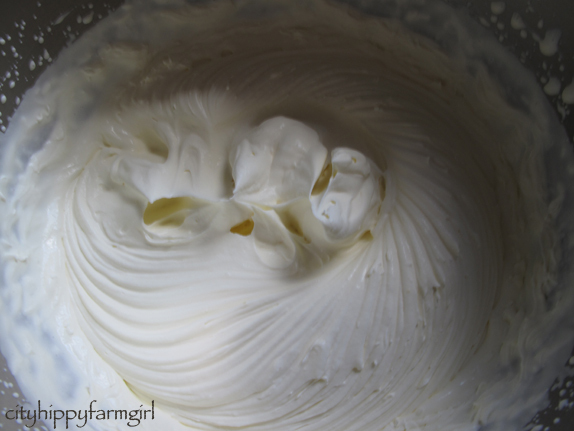 This entry was posted in Food Glorious Food, Going Green and tagged butter, city living, dairy, easiyo, easy, frugal cooking, Frugal Living, home cooking, how to make, Making, Creating + Frugal Living, recipes, simple, yogurt, yogurt maker by cityhippyfarmgirl. Bookmark the permalink. i made my own yoghurt for years brydie but regardless of the milk i used it was never like commercial yoghurt..but i’ve never made it with all powdered milk so i will give it a go and see if i prefer it..where do you purchase the yoghurt mix? i’ve never seen it anywhere..and i love the idea of making butter..
Jane the packaged yogurt mix is in the canned fruit section in my supermarket. All it has is the powdered milk and dried cultures already in them, and it’s done by the Easiyo brand again. I think they are about $3.50 a packet? Butter back into cream eh? I don’t even know how on earth that could be done. That would have been rather exciting as a kid. Home made yogurt is the bees knees isn’t it. This is such an informative post. I’m afraid I’ve never done anything like this, it looks like great fun! Thanks Frugal Feeding glad to help out. Dead easy if you want to give either one a a go. Thanks so much for those recipes, I made my first batch of Greek yogurt last week and now I can get the powdwered and keep it going, I use Greek yougurt as sour cream, in soups on tacos, possibilities are endless, and love putting jam in for breaky!! me too Jen. I use natural yogurt on top of soups, mexican, middle eastern, rice, pastry, cakes… actually there isn’t much i don’t add it to! I HAVE THAT YOGHURT MAKER! 😀 I am loving it after buying it a few weeks back. I confess, though, to still using the pre-prepared sachets (I bought a box of the completely plain low fat ones). My next task is to try things with soy or another non-dairy option. It’s easy huh 🙂 The sachets are a good way to start off, and then you can easily switch it to just the powdered milk and cultures down the track. When I was little we made butter at primary school in a glass jar, with a lid and a marble inside. Kept us kids super busy for ages shaking our cream up and waiting for that magic moment. We then got to put the butter on the damper bread we also made. Yum! yogurt’s always welcome anytime of the day! Thanks for this post, although I enjoy making both, it was refreshing to see a slightly different recipe for the yogurt. I was also thrilled to see the idea of adding home made jams to the yogurt, I wish I had thought of that!!! Kim if you have a cupboard anything like mine there is always a lot of different types of home made jams floating around which means options for the yogurt flavours. I think that’s why my kids like it… the whole selection process! Love the look of that bowl of whipped cream. I’ve not written a blog post about it, but I have of course made both. Haven’t made butter for many years, but I used to do it by taking the cream from the top of the milk and shaking it in a jam jar – but this was for small quantities. I made cultured butter by mistake recently by over whipping creme fraiche. Really want to try that properly – it was quite delicious. I’ve never made either, but I like the butter idea for those special occassions, thanks for the great inspirational ideas! It is good for special occasions Yvette. I don’t make butter regularly but it always tastes so good when I do! When I was younger, my sister and I made yogurt in this fancy machine with little cups of yogurt. I have no idea what happened to that fancy little machine- but discovered how to make it in a crockpot- http://chickensintheroad.com/cooking/homemade-yogurt-in-a-crock-pot-and-yogurt-cheese/ I’ve made butter with the children- but it is not practical for our needs. Although creme fraiche` is something else all together. Thanks for this post, Brydie. I’ve never done this post. Thanks for sharing. 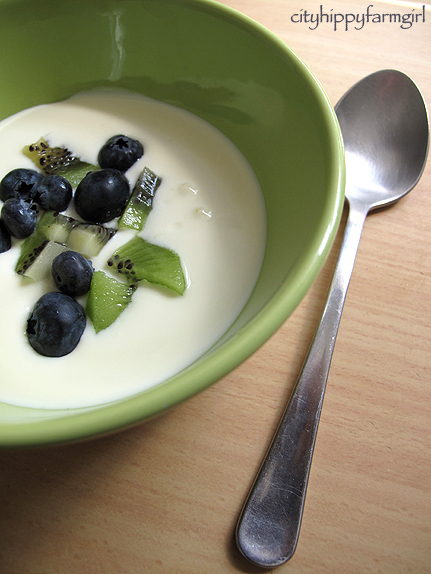 I do need to give homemade yogurt a try. If you eat a lot of it, it’s definitely worth making it. oh I love this! I used to make my own yoghurt long time ago and I forgot how. thnk you for this post. and for visiting my page. your blog is amazing, I will stay tuned. Thanks Barbara, yours too 🙂 Your breads are amazing! If you look at the ingredients of a lot of bought yogurt, (depends on the brand) there can be a whole paragraph of ingredients. Thickener, gelatine, sugar++, soy products. With the added jam to the yogurt, it doesn’t taste overly jamy just adds a sweetness that in bought yogurt would either be done with sugar or sometimes fruit juice. 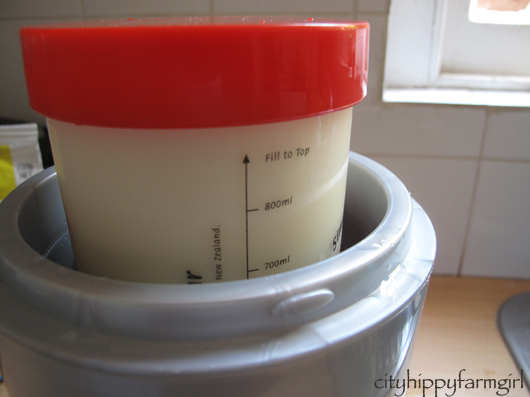 I bought an easiyo from an op shop a while ago to make my natural yogurt in but until now I did not know how to do it! Reading your post made me realise I made butter once as a kid. I got in trouble for it as I was only supposed to be whipping cream, but kept the mixer going too long! I had no idea that you could keep a yoghurt culture going for so long. Makes sense really when you think about it though.. I make my own yoghrt, but using fresh milk. I’m not fond of the taste of powdered milk so wasn’t thrilled about using powdered for my yoghrt. Does it have a powdered milk taste? It takes a little longer using fresh milk- but not much. I heat the milk to almost boiling point and then cool until I can keep my hand on the side of the pot without buring it (I donlt have a thermometer) and then I stir through a tablespoon of old yoghurt. I then bottle in old glass bottles and put in a cooler bag or esky with a cople of bottles of hot water. HI Tricia I don’t think it does have that powdered milk kind of taste. I’m not a fan of the milk either but as yogurt, the cultures seem to take over the taste, especially if you leave it as a tangier one. This is why I selected you for the Versatile Blogger award. I’ve never seen a better description for making yogurt. I’ll have to try this one. 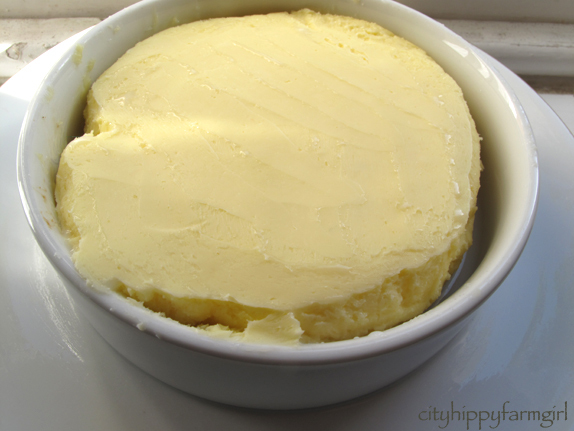 I might have a go at butter once just for fun – yours looks lovely! Such a timely post for me thank you! I bought a yoghurt maker about a month ago and have been a little wary of trying without the sachets but your guide makes it sound super easy so am def going to try it Hooray for homemade yoghurt! Oh fantastic! Another thing for my to-do list. I love the idea of making yoghurt…..& adding jam to sweeten it.